The Mario creator is a living, breathing ARG. 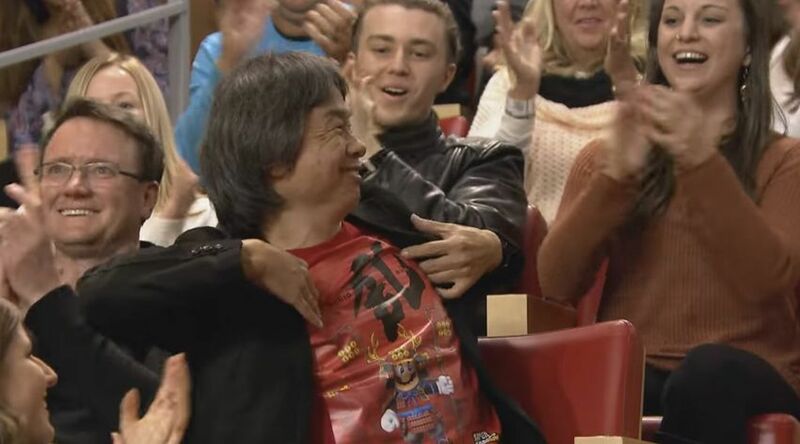 Nintendo executive Bill Trinen teased that the t-shirt Mario creator Shigeru Miyamoto wore during his appearance on Wednesday's The Tonight Show holds some kind of secret, possibly for the Mario game being made for Switch. "Has anyone figured out what's up with Miyamoto's Samurai Mario shirt?" he tweeted on Thursday night. "'Cause I know what's up," he added in a follow-up tweet. Take a gander at the image and you'll notice that Miyamoto's shirt shows off Mario wearing a samurai outfit. Eager fans piled into Trinen's Twitter thread to propose theories. "In case you were wondering, the kanji on Miyamoto's shirt is 'Ran,' which in Japanese is pronounced exactly like 'Run,'" replied Twitter user Kyle McLain. Trinen acknowledged McLain's supposition: "First layer of the punion." Miyamoto's shirt could be hinting at a power-up used in the forthcoming Mario game for Nintendo Switch. Note that Trinen's explicit use of "Samurai Mario" follows the naming syntax Nintendo applies to power-ups, such as Raccoon Mario in Super Mario Bros. 3 and Cat Mario in New Super Mario 3D World. Nintendo offered a peek at a new Mario game running on Switch back in October when it rolled out its Switch reveal trailer. As to Samurai Mario and the true meaning behind Miyamoto's seemingly innocuous t-shirt, only time will tell. Apparently the Kanji reads "Ran" on his shirt, which is pronounced like "Run", so it might just be a good pun. Isn't it likely, that since it says run, it has to do with the game called Super Mario Run...? Yes! But! The plot thickens! B) To my knowledge Mario does not don samurai armor in Super Mario Run. Maybe he does and we haven't seen it yet. But maybe not. Clearly the next game will be based on the works of Akira Kurosawa. Mario, your princess is in another Hidden Fortress! That's not the way that happened at all! She was in this fortress, but it was burned down as she went insane! We've been Bowser the entire time! Mario is a Tokyo bureaucrat with terminal stomach cancer.